(Macao – 19 April 2019) The Chief Executive, Mr Chui Sai On, will visit Beijing from 24 to 29 April to attend the second Belt and Road Forum for International Cooperation, and the Beijing International Horticultural Exhibition. The Chief Executive, Mr Chui Sai On, attends a plenary session at the Legislative Assembly. The Chief Executive, Mr Chui Sai On, outlined on Thursday (18 April) a Government proposal for a healthcare insurance scheme designed to cover Macao ID holders that have a mainland residence permit entitling them to live in Guangdong Province. The Chief Executive, Mr Chui Sai On, a question-and-answer session at the Legislative Assembly. The Government plans to set up an investment and development fund. Part of the fund would be spent on projects including Macao’s work to advance the development of the Guangdong-Hong Kong-Macao Greater Bay Area (Greater Bay Area). Prof Tsui Lap Chee, President and Founding member of the Academy of Sciences of Hong Kong and world-renowned molecular biologist, was appointed as “Conference Ambassador” by the Secretary for Economy and Finance of Macao SAR Mr Leong Vai Tac last Friday (April 12). Prof Tsui pointed out that Macao has well developed software and hardware facilities for hosting conventions and exhibitions, which, together with the Macao SAR Government’s policy that “gives priority to convention and provides precise support”, will be able bring in more international academic conferences to Macao. The seminar on “Civil Litigation” will take place on April 23th to 26th in the auditorium of the Civil Service Training Centre located on Alameda Dr. Carlos D' Assumpção n.° 322-362, Cheng Feng Commercial Centre, 7th floor. The seminar aims to consolidate and update the technical knowledge of our professionals in the area of law in terms of the legal framework, legal nature and function of civil procedural law, aspects related to evidence, various means for the exercise of rights, particularly in view of the recent reforms of the Portuguese Code of Civil Procedure and the fundamental principles governing the procedural process. The Tourism Crisis Management Office (GGCT) is paying close attention to the earthquake that occurred in Hualien, Taiwan, China, and maintaining close contact with the Macao Economic and Cultural Office in Taiwan for further developments. Until the present moment, the Macao Economic and Cultural Office in Taiwan has not received any requests for information or assistance. The Consumer Council conducted its ‘Supermarket price survey’ of the second-half of April on 17 April for the implementation of Section 2b), Article 10, Law 4/95/M of 12 June. Surveyed locations included 13 supermarkets in São Lázaro, São Lourenço and Sé Parishes. Consumers may now check the report data on the Council’s website (www.consumer.gov.mo), the “Supermarket Price Information Platform” app, or the Council’s WeChat account. 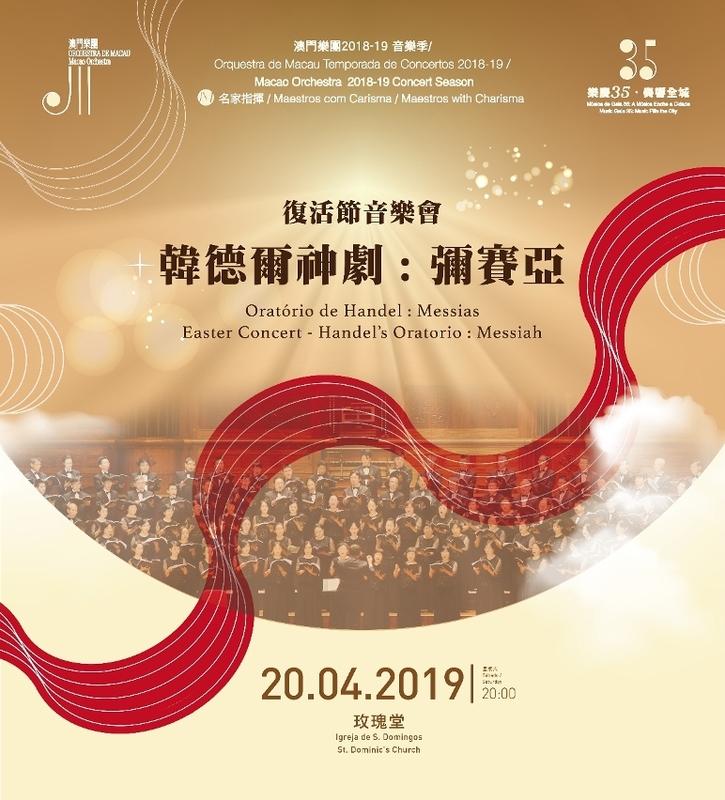 The Macao Orchestra (OM, from the Portuguese acronym), under the auspices of the Cultural Affairs Bureau, will present the “Easter Concert – Handel’s Oratorio: Messiah”, part of the Maestros with Charisma series, at St. Dominic’s Church at 8pm on 20 April (Saturday). Under the baton of OM’s Music Director Lu Jia, the orchestra will join hands with four remarkable vocalists from South Korea and the Taipei Philharmonic Choir to perform excerpts from the Messiah, a timeless masterpiece by Handel. Admission is free. Information from the Statistics and Census Service (DSEC) indicated that the annual mean air temperature in Macao edged down by 0.2 ºC year-on-year to 22.8 ºC in 2018. The highest temperature of the year was 35.8 ºC in May, down by 2.2 ºC year-on-year, marking the hottest May since 1952; meanwhile, the lowest temperature was recorded in February at 4.6 ºC, down by 2.5 ºC year-on-year. Total precipitation was 1,795.6 mm, a slight increase of 12.4 mm year-on-year.